How to make your own little oasis at the campground. Making your camping and family trips stylish and comfortable. If the idea of falling asleep under the stars and roasting marshmallows around a campfire appeals to you, but the reality of pitching a tent and sleeping on hard, bumpy ground does not, glamping could be your ideal vacation. No icky spiders, chili mac, or peeing in the woods for the glamping crowd. Think Jeeves toasting your Trader Joe's marshmallow to perfection as you relax with a chilled Chardonnay in your portable hot tub, roughing it by the ocean. 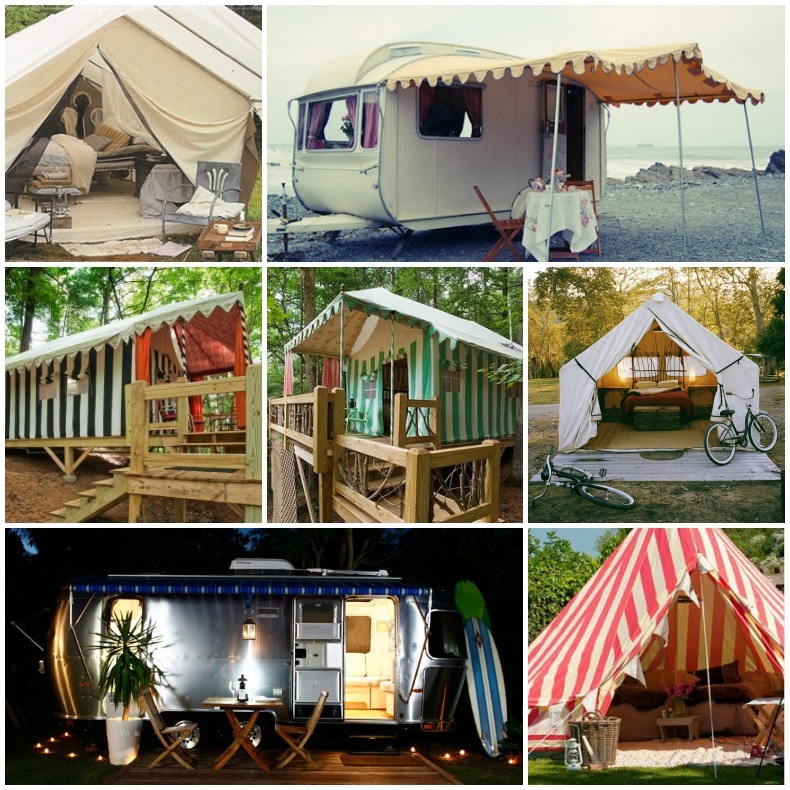 Forget the beach house clam bakes, go ahead and trade in your time share for a tent, camper or airstream. Guaranteed to be a getaway you won't soon forget. If it's an ocean view from a mountain side you crave check out Big Sur Getaway on the California coast. Maybe you are looking for more, 5 star Southern California resort glamping by the beach at El Capitan Canyon. 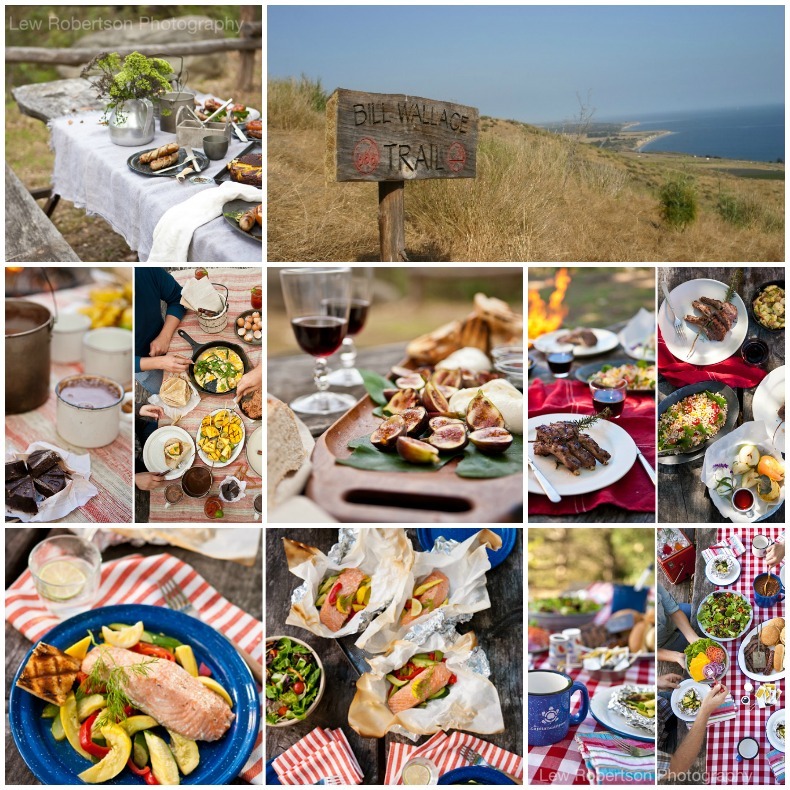 El Capitan Canyon offers BBQ kits & breakfast-They deliver everything you need to make your dinner on the grill! Chicken/steak or fish with veggies or baked beans, salad, and garlic bread. Breakfast kits of hot granola in mason jars with blueberries & almonds, grilled pears, and a delicious citrus tea or maybe try the upside down apple cornbread, grilled bratwurst, grilled grapefruit halves with honey and fresh coffee. What's better than a huge Mexican breakfast outdoors? The menu consisted of a large iron skillet filled with fried eggs and topped with cheese and tomatillo salsa, refried beans, corn tortillas heated in foil packets, grilled pineapple and mango skewers, sliced avocados, tomato juice with lime in salt & chile rimmed jars and fresh Mexican hot chocolate! Are you hungry yet? This is how you go glamping.